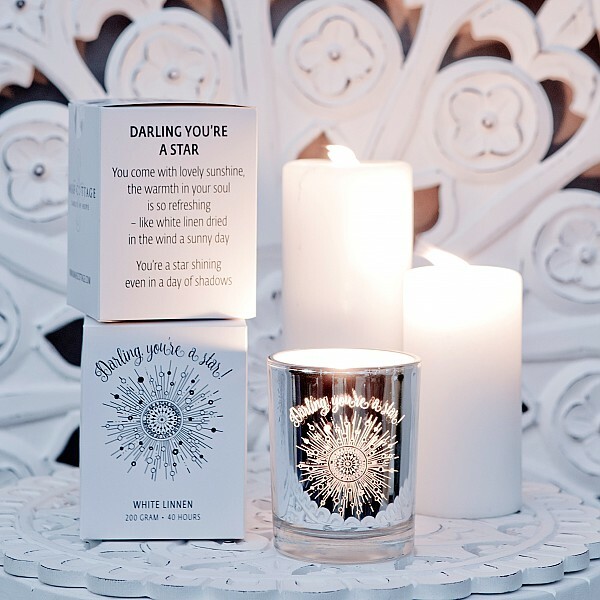 Majas Doftljus "Darling you're a star" med ljuvlig doft av white linen/vitt linne. Ljuslykta i silver med matt vit insida, vackert mönster och texten "Darling you're a star!". Fin presentförpackning med text "DARLING YOU'RE A STAR you come with lovely sunshine, the warmth in your soul is so refreshing - like white linen dried in the wind a sunny day You're a star shining even in a day of shadows". Brinntid ~40 h.